Home » Kits+Extras » Jewelry Creations » Magnetic Progressions Lariat Plus! We are able to offer a very subtle variation on the Magnetic Progressions Lariat that we have long had as one of our most popular jewelry pieces. The lariat is basically long necklace piece, without a clasp (left open) but with the addition of magnetic hematite beads so it can be twisted upon itself and worn in quite a number of fun ways. Every few inches there is a magnetic hematite bead -- in the original, a simple 6mm in charcoal grey. 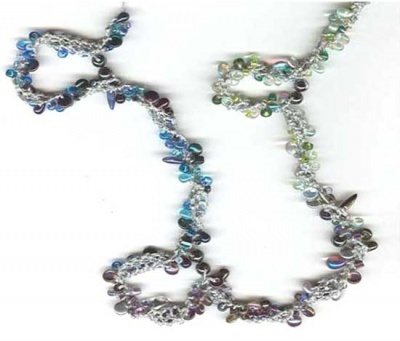 What makes this kit different is the addition of your choice of some really lovely colored magnetic beads. 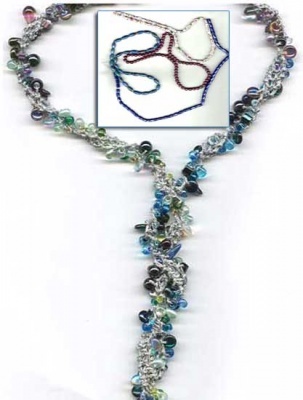 The picture on this page shows the original finished lariat with the four new colors of magnetic beads. 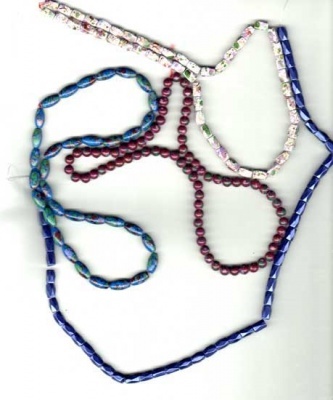 It is not a completed version of this new variation and those beads in the middle are not a lariat but rather the four new possible magnetic beads you can choose for your own unique piece. What we have here is the option to get a kit to match the magnetic bead that you choose. Instead of the plain grey magnetic beads, these magnetic ones will play with and enhance the others in your lariat. It is very hard to get these beads to sit quietly for a photograph because they insist on attaching together (ah! the magical wonders of magnetism...) So please bear with me and I will simply describe them. The lightest ones towards the top of the second photo here is 5x8mm 4-sides Swirl White -- the background of the bead is white with swirls of pinks and greens of varying tones. The kit that will come with 13 of these beads will make a lariat of mainly whites, pinks and greens. And last but not least, in the center, you see a deep burgundy round bead -- that one is 6mm and again in the Picasso style but this time Burgundy is the main color. 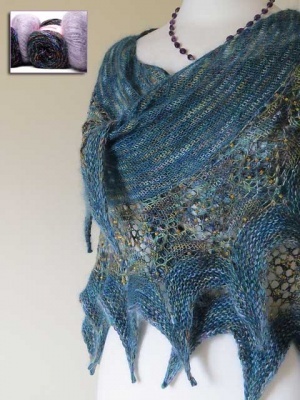 The other hues I see on the bead are pinks and greens -- and so again the kit will be a mix of these colors, burgundy predominating, with the others as highlights. 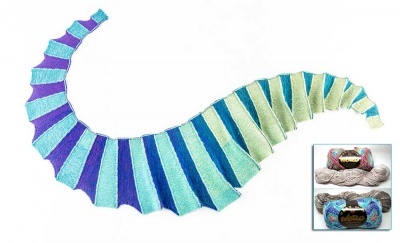 Each kit will include at least 20 meters of thread, either silk or metallic polyester, roughly 45 grams of a bead mix and about 13 of whichever special magnetic hematite beads you have chosen. And your choice of the pattern or not. You will have everything you need except for the knitting needles -- we used size 0/ 2mm. Make sure to choose from the drop-down menu before checking out. One thing we want to make you aware of -- take this as a warning: People with a pacemaker should not wear magnetic jewelry! And pregnant women should consult a physician before wearing magnetic items.